We’ve been at Barnes & Noble about an hour. I’ve been doing my things on my iPad. Kate is working jigsaw puzzles on her iPad. She hadn’t made a sound for almost the entire time we’ve been here. A minute ago, she broke the silence and said, “Fun.” She was expressing her feelings about working her puzzles. I know she must be having fun because she spends at least six hours a day working them – at home, at Panera, and at Barnes & Noble. This was the first time, however, I have heard her express her feelings about it. In the meantime, I am noticing that it’s been a while since she asked my name, and, not once, has the subject of my being or not being her husband come up. We’ll be leaving here shortly. I have a Rotary dinner this evening. It is a benefit for Alzheimer’s research, and I will be making a few remarks. I changed the sitter’s schedule to come at 6:00 this evening. This will be the first time I have left her at night. I am optimistic this will work out well. My plan is for Mary to take Kate to get her Friday night pizza. That should help them pass a little of the time. The rest of the time they can relax at home. I just asked Kate if she were ready to go. She said, “I’m just piddling. I just want to finish this one. . . Then the next one and the next one . . .” Then she said, “You had better just say when you think we need to leave. I said five minutes would be fine. She said, “Let me finish this one first.” I am really glad she has her puzzles. Yesterday after leaving the orthopedist, we went to Panera. We hadn’t made it in the morning, and Kate said she was a little hungry. I got her a muffin. There’s a nail salon a couple of doors down from there. It had been too long since she had had a manicure and pedicure, and they were able to get her in and out before dinner. I used to see that she went there at least once a month, but somehow got out of the habit. She doesn’t express any special pleasure when she goes, but she used to enjoy it. Besides she needs to have her nails trimmed. Two or three years ago I also arranged for her to make regular visits to a nearby spa. She goes every two weeks and alternates a massage one time and a facial the other. This is not something that was a regular part of her life before I started it, but I thought it would be good for her to have something that was a treat and something she could do without me (except for making the arrangements and providing transportation). Like the mani/pedi, she doesn’t express a lot of enthusiasm, but I believe she must enjoy it. The only comment she makes is how soft and smooth her skin feels after the facial. She’s right. It does. Surprise, Kate worked outside with her shrubs yesterday. Yesterday that changed. When I came home after going to the Y and running errands, I found Kate pulling the new growth on shrubs along our driveway. I had two immediate reactions. The overwhelming one was a burst of happiness. It’s been a while since I have written about her work in the yard, so let me summarize why I felt this way. Since her diagnosis, more than seven years ago, Kate has had three primary activities other than those I provide for her. One was working on family photo albums. She was introduced to this by her brother, Ken, who has completed numerous albums. He and Kate worked on one together, an album about their mother’s family. It represents a beautiful family history. She wanted to create her own albums for us and our children and grandchildren. She got her start after she was diagnosed with Alzheimer’s. Even though she worked on one for several years, she never got beyond selecting photos and editing them. Two years ago, she just stopped working on her computer altogether. She didn’t even continue with email. I think it got too challenging for her. That left her with only two other activities. The major one was working in the yard. That meant pruning and “pulling leaves.” She had learned about the value of pruning long ago. As her Alzheimer’s progressed, I think she did it for herself more than here shrubs. It was a kind of therapy. It required little effort. When she had pruned back about as much as she could, she started pulling off the leaves. There were days when she would spend as much as 6 hours outside. It was great because she enjoyed it, and it was something she could do on her own without anyone’s telling that she was doing anything wrong. This past fall she stopped working in the yard. I suspected that the colder weather played a part. In addition, we both had colds and the flu during the first of this year. When the weather began to improve, she didn’t get back to her yard work. I began to think it was a thing of the past, so I was much relieved to see her working yesterday. I said, however, I had two immediate reactions. The first was elation. The second was apprehension related to the condition of the shrubs. I knew there was a chance that some of the shrubs could be permanently damaged by what she had done before, but I felt it was worth it for Kate. As spring has approached, I have been eager to see how many, if any, of the shrubs would come back. As I expected, it appears that some of them are dead. Others appear to have dead branches, but there is new growth coming from the base of the trunks as well as the roots around the base. In addition, there are some that look like they are going to be just fine. So why the apprehension? That arises from the fact that the ones that look fine have new leaves that are sprouting. Those, of course, would be the only ones with leaves she can pull. It is still too early for them to have an abundance of new leaves. Many of them have only a handful. This means that the very ones that seem to be living may not ultimately make it. My hope is that enough of them survive to keep her busy until next winter. Yard work is important to her and, thus, to me as well. If she loses that, she will have only one activity of her own, working jigsaw puzzles on her iPad. Right now she spends 5-6 hours a day, and sometimes more, doing that. It has become harder for her in the past year, but I see no sign that she is about to drop it. I never imagined how important an iPad be could. She doesn’t use it for anything other than jigsaw puzzles. I am thankful she has it. After our two back-to-back trips to Panera this morning, Kate and the sitter went again this afternoon. Kate was resting on the sofa in the family room when I got home to relieve the sitter. Her behavior after the sitter left makes me think she may have been either tired or bored. Typically, when I return home, she gets her iPad and is ready to go to either Panera or Barnes & Noble. She didn’t do that today. She continued resting. I decided to look over the tax returns I had picked up from the accountant after leaving the Y. I went to the back of the house for something and stopped at the sofa where she was lying. She asked what she could do. I mentioned several possibilities, one of which was Panera. She jumped on that. She said, “I just want to get out of the house.” She put her coat on and walked into the kitchen where I was putting my laptop in its case to leave. Apparently, she had forgotten about Panera. She asked again, “What can I do?” I told her I was just getting ready to take her to Panera. Then she asked, “Are you going to stay with me?” I said, “Of course, I will be with you.” She seemed relieved. This is another of those times when I have the feeling that she may not be enthusiastic about the sitter. I’m not sure this is true because of the way she greets the sitter when she arrives. Kate seems very comfortable and at ease with her. It may be that she thought that I might be leaving her alone. We’ve been here over an hour now and will leave shortly for our Monday night Mexican meal at Chalupas. When we left home, she seemed a little down, not as cheerful as she was this morning. Perhaps that was because she had been resting a while. Now she is perfectly fine. A moment ago, she asked for my help getting back to the right place for her jigsaw puzzles. She occasionally hits a wrong button that takes her to the store and doesn’t know how to get back. That had already happened a couple of times since we arrived. This time she said something that warms a caregiver’s heart. She thanked me for helping her and said, “You know what I like about you? You don’t treat me like I’m stupid. You just show me again how to do it.” I am not only touched by her sentiment. I am also struck by the fact that she realizes that she is asking me over and over to do the same thing. Her expression of appreciation makes it much easier to keep helping her. I know, of course, that she is not remembering other occasions when I may demonstrate less patience than I did today. 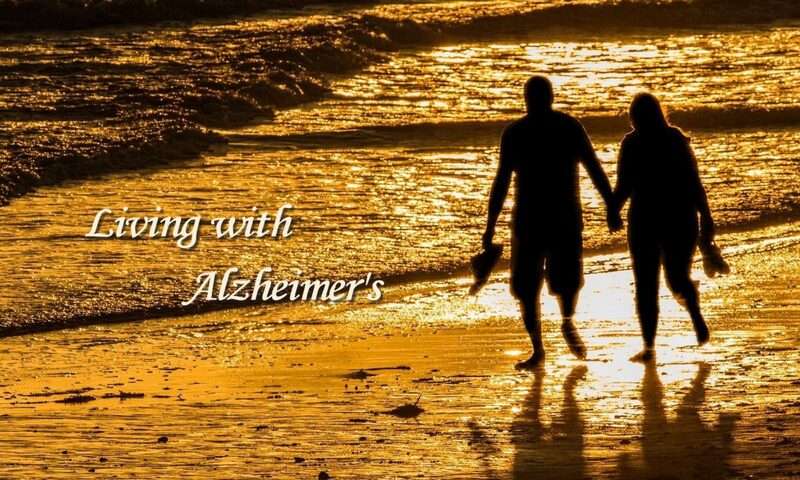 Nonetheless, this is another of many reasons I believe Kate and I have been very fortunate living with Alzheimer’s. I know many couples are not so lucky. Things pick up in the afternoon. She was talking about her photo album of our family. She hasn’t worked on it in at least two years, but she still occasionally mentions things that she wants me to remember to put in the album. I could tell she would never finish the album more than two years before she stopped working on it. The only thing she has ever done to create the album is to select some family photos for inclusion and edit them. She has never put anything into the software that she would use to make the albums. She did edit and edit and edit the photos. That was the first of her activities to go. That left her with the yard and jigsaw puzzles on her iPad. Now it’s looking like the yard may become a thing of the past as well. Speaking of the yard, spring is on the way. We see various trees and shrubs beginning to bud and flower. I have been watching to see if we might get any new leaves on the shrubs around the house. I am glad to see that at least some of them are coming back. I haven’t seen any indication that others have any new growth. They are completely bare. I’m not going to give up hope just yet, but it’s not looking good. The short rest that Kate had gotten after lunch must have done the trick. She has been just fine since she got up. Once we were at Barnes & Noble, she got rather chatty. She started reminiscing about her mother and father as well as our marriage and how good she felt about our children and grandchildren. These are things she says quite often. She and I talk about how fortunate we are. Periodically, she would say, “Okay, I’m going to stop now.” She would look down at her iPad. Then she would start talking again. She must have done this at least four or five times before she really stopped. At that point, she said, “Now, I think I’m going to play.” Then as though she had to justify that to me, she added, “You know, you can’t do serious things all the time.” I am glad to see I’ve got the “real” Kate back now, and I am grateful that we always seem to have good afternoons and evenings. Yesterday was another good one for Kate and me. She was up a little earlier than usual, and we spent almost two hours at Panera before having our customary lunch at Bluefish Grill. After lunch, I asked her if she would like to go directly home or stop by Barnes & Noble. I was pleasantly surprised when she said she wanted to go home. I say that because she hasn’t wanted to spend much time at home recently. It turned out that she was tired and wanted to rest a while. After resting for almost two hours, she told me she was going outside to “pull leaves.” Again, I was surprised and very pleased. It has been weeks since she has worked outside. That is something that used to occupy most of her time during the day. More recently, the winter weather, our having the flu, and the fact that there are barely any remaining leaves on our shrubs has kept her inside. That hasn’t last long before she was ready to get out to Panera or Barnes & Noble. I had begun to wonder if, not when, she would pick up her yard work again. She was outside for a full hour before coming in. She was happy. As I have said before, working in the yard is her therapy. The second surprise, this one for Kate, came next. She received a phone call from Meg Wright, a very close personal friend from Texas. She and I had exchanged emails a couple of days before to work out a good time for a call. When I mentioned to Kate that Meg was calling, she immediately recognized the name but asked, “Where do I know her from?” I told her they were old friends from Fort Worth and that she had been one of her bridesmaids in our wedding. She remembered that. I also conveyed to Meg that Kate would be weak on remembering any details of their past as she is with our children and grandchildren. I suggested that Meg might mention some of the old memories and that would help her remember. As I expected, the phone call went very well. It wasn’t a long call, perhaps twenty minutes, but the impact was as great as if it had been an hour. By last night, I am sure she had forgotten all about the call, but it had been a moment of pleasure with a very dear friend from her past. Once again, she had had a very good day, and so had I. By now, you know how much we frequent Panera and Barnes & Noble. I think we may have set a record today. We were at Panera from 8:30 to 9:30. Then we were home an hour while Kate rested. We were back shortly after 10:30 and remained there until 11:50 where Kate had her lunch. I left for Rotary shortly after the sitter arrived at noon. When I returned home at 4:00, the sitter said Kate has rested a while after left. Then they went back to Panera at 2:00. I arrived back at home as they returned from Panera at 4:00. Knowing that we still had almost two hours before we would have dinner, I suspected Kate would want to get out of the house even though she had just returned home. I decided to offer her a choice. We have a DVD of some of the films her father had made during the 1930s. It includes her mother’s graduation from college and some of Kate’s earliest days as an infant as well as some family times at her grandparents’ home. I asked if she would like to look at the DVD or to go someplace like Barnes & Noble. She quickly answered the latter. Based on our recent experience, I suspected that would be her choice. Since she hasn’t been working in the yard, she has spent very little time in the house. There have been a few occasions in which I have suggested that I turn on some music and sit together in the family room. She has accepted, but she never lasts very long at all. The only time she will sit down and enjoy working on her iPad at home is after dinner in the evening while I watch the PBS Newshour. Recently, I have tried a DVD with an opera. She hasn’t watched, but she has enjoyed listening. Last night, I hooked up my laptop to the TV and showed her a slide show that I had made of our trip to Switzerland three years ago. She seemed to enjoy that but not as much as the opera. I think that was because she still connects with music whereas as she has no memory of Switzerland. It was like looking at a travel show on TV. She did enjoy seeing the pictures of us and seemed to appreciate the beauty of Switzerland. This desire to be out of the house must relate to being in a setting where there are other people. She notices some of the tutors here at Barnes & Noble and even comments about them. For example, she told me a little earlier how impressed she was with the tutor at the next table. She told me how supportive he was. I must acknowledge that I also enjoy the stimulation of public situations. We are not always engaged in conversation, but I do feel a connection with the others who are here. That is especially so for those we see most often. As I have said before, I have deliberately chosen to eat out for all our meals and to make our morning visits to Panera and afternoon visits to Barnes & Noble. I didn’t, however, fully anticipate how much this might mean to both of us. It gives us a feeling of being “out and about” at a time when our world is really shrinking. I imagine those who read this blog on a regular basis would say that Kate and I have maintained an active lifestyle throughout the period since her diagnosis. You are right. We are busy. Upon receiving the diagnosis, we made a commitment to do as much as we could with our remaining time. I think we’ve done pretty well. I have become an event planner for our daily lives. That doesn’t mean planning lots of special activities although there have been plenty of those. It means making the everyday activities special. Things like our morning visits to Panera as well as eating out for lunch and dinner have become highlights of every day. We do live full lives; however, that doesn’t mean that life is the same as it used to be. Even before Kate’s diagnosis, she gave up her most fulfilling activity as our church librarian because the early symptoms were keeping her from performing her duties as she knew they should be done. She had served faithfully for 19 years and had made the library the “go-to place” for Sunday school teachers and children. Her academic credentials (M.A. in English and second Master’s in Library Science) combined with her professional background as an English teacher and school librarian made her a perfect fit for her position at the church. She took great interest in helping everyone who was looking for just the right book(s) for a particular occasion or person. She worked nearly fulltime as a volunteer. Stepping down from this position was a major change in her life. At the time of Kate’s diagnosis, she was still driving. She continued to drive another two and a half years before having an accident. Until then, she was free to do pretty much what she wanted. She and her friend, Ellen, had lunch together every Monday when I was at Rotary. They also got together at other times during the week and often went shopping together. They shopped for plants. They shopped for clothes. They shopped for knick knacks for their homes. I know from looking back at my journal that Kate experienced lots of frustrations related to her worsening memory, but there were no outward manifestations that anything was wrong. It was only after three years that Kate told Ellen about her diagnosis. Ellen had not even suspected. After an auto accident in which she totaled her car, Kate’s world became much smaller. She was now dependent on me to get her where she wanted to go. Of course, she also got around with Ellen, but it wasn’t like having the personal freedom that driving her own car had given her. She continued to be active in PEO. She attended their monthly meetings, hosted meetings at our house, and occasionally presented the program. She also served on a scholarship committee that had responsibility for interviewing and recommending candidates for scholarships and grants through the national office. She began to forget meetings and found it difficult to fulfill her obligations on the scholarship committee. As her memory worsened, she couldn’t remember the other members. I suspect that she had difficulty participating in the conversations. She no longer wanted to attend and ultimately dropped out. That is when two of her existing activities came to dominate her life. The first was the yard. She had always enjoyed tending to her plants. Now she could devote more time to that interest. The other was her computer. For a number years she had enjoyed working on photos and had started work on a couple of family albums. She never came close to completing one, but she was very active in picking out and editing photos. Even today, when someone asks her what she is doing, she tells them she is working on her family albums. Like most of us, she also used her computer for emailing. At some point, I gave her an iPad and introduced her to several jigsaw puzzle apps. Little did I know how important these would become in the years ahead. With the progression of her Alzheimer’s, working on the computer became more difficult. She was frustrated. She stopped checking emails. Gradually, she stopped using the computer. That left two activities she could do on her own, pruning the shrubbery and working jigsaw puzzles on the iPad. She had no trouble filling an entire day between these two activities. They were things she could do without having to experience the challenges of coordinating with other people. She could work at her own speed, and nobody was telling her what to do. Her friendship with Ellen was her only close personal relationship. Our children had grown up together in the same neighborhood. Ellen and her husband, Gordon, were our very closest friends in Knoxville. Then in 2013, Gordon died. Two years later in August 2015, Ellen had a stroke while visiting her daughter in Nashville. She has never been able to return and is now in memory care. We try to visit her once a month, but the relationship can’t be the same now. So Alzheimer’s cost Kate her volunteer job at church. Then she had to give up driving. She lost the ability to use the computer. She lost her best friend to a stroke. Her world has shifted from one of high involvement to only working in the yard and on her iPad. One of my concerns right now, is that she has been spending less time in the yard than she used to. The weather accounts for part of it, but I think it is more than that. Three years ago, we were visiting Lowe’s two to three times a week for plants. She spent a good bit of her time planting them. Finally, she was running out of places for new ones. She could, however, continue to prune. She started her pruning a year before my dad’s 100th birthday party in October 2013. Gradually that turned into just “pulling leaves.” Right now there are few leaves left on any of our shrubs. That may also play a part in why she is not spending time in the yard. Spring will be here soon. I am eager to see if her interest in the yard will return to the passion it was before. I fear that it won’t. That will leave only her jigsaw puzzles. Everything else she does is dependent on me. She needs me more than ever. Yes, I keep her busy, but there is no denying that her life is dramatically different than it was before Alzheimer’s. It is 5:06 p.m. We’ve been at Barnes & Nobel for almost three hours. When we got here, I thought we might be here no more than a couple of hours, perhaps less. What is amazing is that as I look across the table at Kate, I see that she is working intently on her iPad. She hasn’t moved since we arrived. She is doing the only thing she does on her iPad, working jigsaw puzzles. Over the past two-to-three weeks, she has spent almost no time in the yard. She must average 6-8 hours a day. Here’s the rest of the story that started at Barnes & Noble. I was saying that Kate has not been working outside much in the past few weeks. That means her only activity is working jigsaw puzzles on her iPad. Starting as much as a year ago, she began to have some difficulties with the puzzles. This meant she relied on me to straighten things out every time she got in trouble. That has improved substantially in recent weeks. It is nice to report that something is better. I have a tendency to think that everything only gets worse. My concern now is that if she lost interest in her puzzles, she would be left with nothing. That would be a serious problem. Watching her today gives me renewed hope that she will continue to pursue this activity for the indefinite future. We are sitting at our usual table at Panera. We arrived early today. Kate was up before I returned home from my walk at 8:00. She was not dressed for church. I reminded her this was church day. She gave me a dirty look and groaned. I hesitated a moment and started to encourage her. Then I decided not to push her. I know she often feels pushed. We decided to come over to Panera for her morning muffin. She has been trying to work jigsaw puzzles on her iPad, something that has been one of only two things that occupy her time. She has occasionally been frustrated while working the puzzles. I don’t believe it is associated with any difficulty finding and placing the puzzle pieces themselves. Rather, it is that she occasionally hits a “button” that take her to a new screen, and she doesn’t know how to get back to her puzzle. In addition, there are times that the app itself offers an opportunity to do something else. She doesn’t know how to “cancel” and get back to her puzzle. This morning has been especially frustrating for her. Over a 5-10 minute period, she repeatedly lost her puzzle. Each time I helped her get another one. She did not ask for my help. She simply put the iPad down on the table and, a couple of times, she closed the iPad as though she were ready to go home. A number of things have happened this week that make me think that Kate is moving closer to another stage of this illness. She hasn’t been staying outside as long, and she hasn’t been working on her iPad as long before wanting to switch to something else. I dread the day that she loses interest in these two activities. They are her life right now and have been for several years. I should say that last night she turned on her computer for a few minutes. I don’t know what she did, but it wasn’t long.